It's every Indian common man's car. Microcar. New look with good stability. Bajaj RE60 is nice in price and it is so cool. It can be launched in India. Best Vehicle For The City. Looks good definitely will go for test drive. And will plan to buy this. More innovative. An improvised vehicle in a low budget in India. 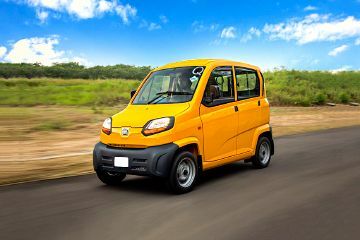 What exactly is Bajaj’s Qute? Is this four-wheeler more than just a step up from the ubiquitous auto-rickshaw? It can reach up to a speed of 70kmph. No, AC is not available in Bajaj Qute. Q. Is there AC is available in Bajaj Qute (RE60)?